Brud's Room, Second Floor of The Wherehouse? The perfect setting for an intimate event. The space is ideal for events with less than 50 people. There’s a bar “hidden” in a barbershop wall, a silk loom from the Clinton Mills, and a wall of gears and tools. Take a walk down memory lane with our collection of memorabilia that encompasses both local and national politics. Main Dining Room, Third Floor of The Wherehouse? 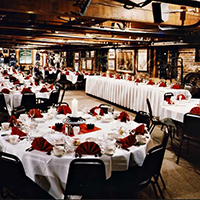 A museum of the birth of industry, the Main Dining Room is the ideal space for medium sized events. Every nook and cranny holds a treasure. The copper bar with railroad ties is adorned with manhole covers and parking meters. There’s a phone booth, a switchboard, and the engine cowl of a Holyoke fire truck. The ceiling and walls are adorned with signs from fire stations and schools as well as hand tools and other relics from history. The room is anchored by an ample dance floor, and an elevated entertainment space. 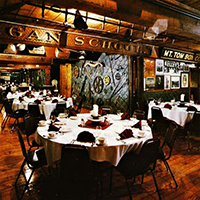 Located on the third floor of our building The Main Dining Room is the perfect choice for functions up to 120 people. Emerald Room, Fourth Floor of The Wherehouse? 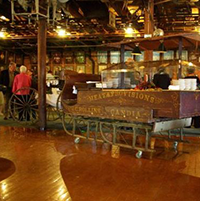 For larger functions, the fourth floor is a showcase of antiques, relics, and memories from the City of Holyoke and the surrounding area. Aerial photographs of the City and the Connecticut River are comingled with portraits and photos from the famous Holyoke St Patrick’s Day parade. There’s a full stage and large dance floor ideal for live music. The bar and cocktail area have a number of conversation pieces including an original “votes for women” pennant and our almost famous birdcages – replicas of Holyoke’s iconic City Hall. The Emerald Room has a large capacity and a number of seating configurations to accommodate a host of functions.